Rose Cottage, Auchendennan in Arden, Alexandria, Dunbartonshire sleeps 4 people. Situated in the heart of Loch Lomond National Park, these stunning holiday properties (refs SRRG, SXXO [Chestnut Cottage], SXXP [Willow Cottage], SXXQ [Primrose Cottage], SXXR [Ivy Cottage], SVVE [Burnbeag], SVVD [Courtyard Studio]) have been lovingly restored and furnished to provide wonderful retreats. Auchendennan Farm Cottage (SLLX) is a single-storey holiday cottage; within the house there is a large family sauna which can be used as an ideal way to unwind. Outside on the sun decking, there is a sunken hot tub which is large enough for all the family and powerful enough to give tired muscles a proper massage. Rose Cottage (SRRG) is a single-storey conversion adjoining the owner’s farmhouse. Combining modern and traditional furnishings, the property boasts a superb hot tub and external sun decked area for relaxing and unwinding. For golfing enthusiasts, the famous courses of Loch Lomond are just a short distance from the property, with an abundance of courses for all standards within easy reach. Cameron House, the 5 star golf/spa resort is just minutes from the property where one can enjoy fine dining, day spa packages and championship golf. Lomond Shores, again a short distance from the property, offers designer shopping, loch cruises and an aquarium. The cities of Glasgow and Edinburgh are easily accessible by car boasting award winning restaurants, theatres, galleries and concert venues, designer shopping as well as many tourist attractions including the breathtaking Edinburgh Castle. Shops 2 miles, pub ¼ mile. Living room with kitchen area. Double bedroom with 6ft bed and en-suite bathroom with over-bath shower and toilet. Twin bedroom. Shower room with toilet. For a better idea of where Auchendennan Farmhouse - Rose Cottage is, you can see Auchendennan Farmhouse - Rose Cottage on the map below. Auchendennan Farmhouse - Rose Cottage is in Dumbartonshire; should you be on the lookout for a special offer, you can find all the special offers in Dumbartonshire. It's always worth checking to see what is on offer at the moment. 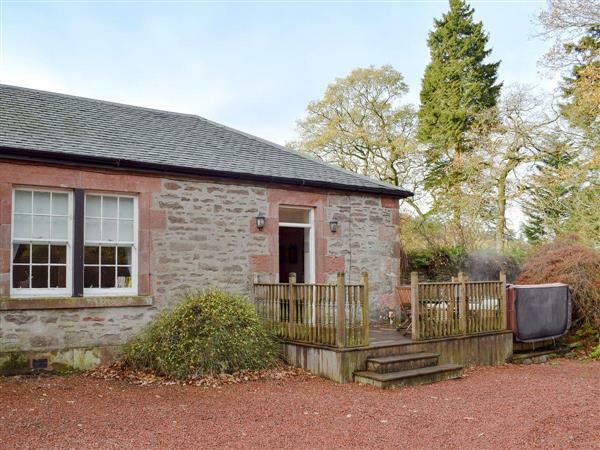 Do you want to holiday near Auchendennan Farmhouse - Rose Cottage (SRRG), you can see other cottages within 25 miles of Auchendennan Farmhouse - Rose Cottage; have a look to find your perfect holiday location.